Rick Stein’s Far Eastern Odyssey is an ambitious journey, avoiding the beaten track and tourist hot-spots, in search of the authentic food of Southeast Asia. In this accompanying book to the major BBC series, Rick shares his favourite recipes and some well-known classic dishes inspired by the fragrant ingredients and recipes he sampled from local chefs, family-run restaurants, street vendors and market stalls. In Cambodia, Rick learns how to make a national dish Samlor kako, a stir-fried pork and vegetable soup flavoured with an array of spices; in Vietnam he is shown the best recipe forPho Bo, a Vietnamese beef noodle soup; and in Thailand, Rick tries Geng Leuong Sai Gung Lai Sai Bua, a yellow curry made with prawns and lotus shoots that you won’t find outside the country. 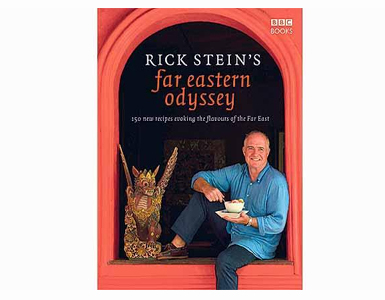 Rick Stein’s Far Eastern Odyssey includes over 150 new recipes from Cambodia, Vietnam, Thailand, Bangladesh, Sri Lanka, Malaysia and Bali each complemented by Rick’s colourful anecdotes from the trip and beautiful on-location photography. This is a visually-stunning culinary tribute to Southeast Asian cooking that evokes the magic of bustling markets, the sizzle of oil and the aromatic steam from a Far Eastern kitchen.